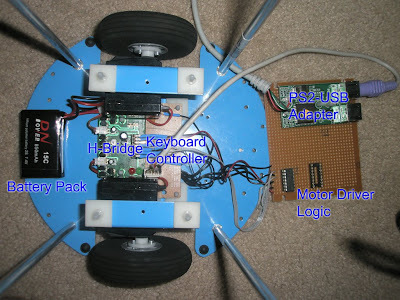 Here is a closser view of the Motor Controller System. The H-Bridge is from the Cybot from Real Robots. The Battery is a Lithium Ion pack from my RC helicopter. It supplies approx 7 volts to the H-Bridge. There is a feed of 7v and Gnd from the H-Bridge (the top two heatshrinked wires heading of the H-Bridge) that powers the IC's on the Logic board. The keyboard controller has three wires going to the Logic board. The grey ribbon cable takes the Logic boards outputs and sends them to the H-Bridge. For anyone wondering why I have a PS2/USB board in there after my statement about saving USB ports, it is so I can test the robot on any laptop or PC without rebooting first.